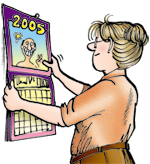 January | 2015 | FBorFW Strip Fix For Better or For Worse Comic Strip by Lynn Johnston. Lynn's Comments: It seems funny to me now to see that I saw myself as "old" when I did this strip. When I look in the mirror today, the 67 year old me looks very different from the face I saw then. I have had to adjust to creases, folds, furrows, jowls and bifocals. I also have a slight tremor, so my head shakes. You gotta joke about this stuff. I like to say, "It's a good thing my head shakes from side to side. If it nodded, I'd be agreeing to everything I'm ever asked to do!" As teenagers, my friends and I made fun of "old folks" Senior's homes we called "Wrinkle City" or "Menopause Manor"--well, I'm there now, and the picture looks different from the other side. When my grandfather said it took courage to be "old," I believe him. And the best laugh of all is: to my aunt Monica who is 85, --I'm a youngster!! This entry was posted in Uncategorized on January 1, 2015 by stripfix. Lynn's Comments: One of the good things about Michael and Lawrence's friendship is that it comes from the heart: two boys with much in common, nothing more. In a few years Lawrence will tell Michael that he is gay, and it doesn't matter. What does matter is their affection for one another. I had no idea when I drew these strips that Lawrence would realize this about himself, and so it was a surprise to me too. Looking back at these two boys, enjoying what will ultimately be a life-long friendship, I'm proud of the story that evolved. This entry was posted in Uncategorized on January 2, 2015 by stripfix. 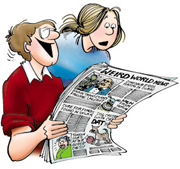 Lynn's Comments: My dad talked a lot about the war, and any time the subject came up in the strip, I received letters from veterans happy to see it mentioned. This entry was posted in Uncategorized on January 3, 2015 by stripfix. Lynn's Comments: I have always had fun with sound effects and radio broadcasts, labels and names. Jim Borecki is the name of a good friend, with whom I have lost touch. I tried to contact him by putting his name in this strip, but so far I have not been able to find him. This entry was posted in Uncategorized on January 4, 2015 by stripfix. Lynn's Comments: I tried to imagine what it would be like for Lawrence to stand outside his old house in a neighbourhood that he loved. He must have felt a sense of loss and confusion. Children have no choice when it comes to enormous decisions like moving, so I assumed he would stand there, wondering why he was now living somewhere else! This entry was posted in Uncategorized on January 5, 2015 by stripfix. Lynn's Comments: Having someone new come into a family is an enormous adjustment. Aaron and I had been a team before I married Rod--and even though Rod adopted Aaron and gave him his last name, their personalities were never really compatible. I wanted Lawrence and Connie's story to be a happy one--one in which everyone adapted and the relationships worked. Having this kind of control over their lives was like playing God! This entry was posted in Uncategorized on January 6, 2015 by stripfix. This entry was posted in Uncategorized on January 7, 2015 by stripfix. Lynn's Comments: Sometimes the strip was confining. I had four panels, maybe 15 seconds a day to tell what became a pretty complicated story. I would have loved to explore Connie's blossoming relationship with Greg. I wanted to show more, write more, but I didn't have the time or the space. This meant that readers had to fill in some blanks for themselves! Maybe, with comic strips going to the internet, creators won't be confined by the "one window a day" method of storytelling that we had in the newspapers. This entry was posted in Uncategorized on January 8, 2015 by stripfix. This entry was posted in Uncategorized on January 9, 2015 by stripfix. Lynn's Comments: This is a true story. The freezer didn't break down, but it did have to be moved and therefore defrosted. I pulled out an archive of forgotten leftovers, summer fruit and fishing acquisitions, dry pie crusts, soup stock, and more. Some of this was still recognizable, so a mess of reconstituted fodder graced our plates for a week or two. People actually ate what I served--and the freezer was then refilled with the leftovers from the leftovers. We recycle. This entry was posted in Uncategorized on January 10, 2015 by stripfix. Lynn's Comments: I never went shopping with my husband; having a man wait patiently, or impatiently, while I peruse a dress shop would be horrible! I would have to rush, which would take away from the true shopping experience. Whenever I see some sad chap sitting uncomfortably outside the change room in some frou-frou boutique, my heart goes out to him. I want to say, "Get off your duff, go do something YOU want to do, and meet her somewhere else!" This strip was done in solidarity with those who shop and those who wait. This entry was posted in Uncategorized on January 11, 2015 by stripfix. This entry was posted in Uncategorized on January 12, 2015 by stripfix. Lynn's Comments: One thing I have tried to do as a doting Gram is to be in sync with the parents: to adhere to the same discipline, to provide the same healthy treats, and to not say anything critical of the parents in front of the children. I think I've scored an "A" on everything--but the treats. This entry was posted in Uncategorized on January 13, 2015 by stripfix. Lynn's Comments: I have never rearranged my daughter's kitchen. But I'd sure like to!! This entry was posted in Uncategorized on January 14, 2015 by stripfix. Lynn's Comments: When my paternal grandmother came to stay with us for 6 months, I was 16 and very independent. My parents both worked, so it was my job to get the dinner on and Gram's appearance in the kitchen was "one too many cooks!" She had just lost her husband, was lonely and depressed, and my dad had invited her to stay. Having spent her adult lifetime looking after others, she naturally put herself to work--on my turf! From the day we set eyes on each other, we were rivals. Gram had my bedroom. I was sleeping in the basement in a "room" made of plywood boards and a curtain. I resented this terribly. I resented her teeth in a glass on my dresser and her clothes in my closet. I also resented being told what to do by someone other than my parents, and her criticism irritated me beyond belief. One day I saw her fidgeting with the oven. It was a gas oven, and she wasn't familiar with the way the oven worked. When I tried to tell her how to do it, she barked at me to mind my own business, that she knew how to operate an oven, and to get out of her way. Figuring this would be a great opportunity to see what would actually happen if you lit the oven the wrong way, I crossed my arms, leaned against the doorway, and watched. First she turned on the gas. The oven door was closed. Interesting. Then she looked for a match. She found the matchbox on the wall and took out a match. She went to the stove, struck the match on one of the elements and opened the oven door. Well--Ka-BOOOOOMMMMMM!!!!!! The explosion blew Granny across the room. She wound up on the opposite side--sitting on the floor with her back against the cupboard doors. Her eyebrows were gone, and all the hairs on her chin were frizzled black. The best thing of all was the look on her face. Her mouth had formed a little "o." I was thinking, "Wow! So THAT's what happens!" It took a few seconds before I reached out to help her up, and a few more for us both to realize that she could have been very seriously hurt! With grateful relief, we hugged each other, and for the rest of her stay, we held a truce. This entry was posted in Uncategorized on January 15, 2015 by stripfix. This entry was posted in Uncategorized on January 16, 2015 by stripfix. In television, they have the freedom to write for a number of characters; to delve into their lives and personalities, but with static lines and panels, we are limited to showing small glimpses of the lives of the secondary characters around them. This entry was posted in Uncategorized on January 17, 2015 by stripfix. Lynn's Comments: One of the things I love to do is sound effects. Trying to come up with the phonetic spelling for the sound a head makes as it hits a pillow, for example, is so much fun. ("FWUMPP" would do it). I think the sound effect I am most proud of is the sound of a toilet plunger. It goes: "Ka_FLOOMP-a-GUSH." Sometimes you have to decide whether to repeat a letter as in "FWAPPPP!" One "P" just won't do it. A smack with a wet towel, for example has to sting. This requires several P's. If you are a fan of Mad magazine, you'll remember the wonderful comic art of Don Martin. His sound effects were fabulous. I think he coined "Fwoooommmm!," and "Ka-chingggg!" One of the weirdest letters I ever received was from Don Martin's wife accusing me of stealing her husband's sound effects. I didn't think I had. The sounds I wrote all came from my head. Then again, can you really lay claim to a cartoon sound? WHHHHOOOOO!!! I sure hope not! This entry was posted in Uncategorized on January 18, 2015 by stripfix. Lynn's Comments: Here's a strip that was written with the express purpose of letting the readers know what was going on behind the scenes. This entry was posted in Uncategorized on January 19, 2015 by stripfix. This entry was posted in Uncategorized on January 20, 2015 by stripfix. Lynn's Comments: An actual quote from my son--he always offered to help if it was something he enjoyed. This entry was posted in Uncategorized on January 21, 2015 by stripfix. Lynn's Comments: This is part of a true story. This entry was posted in Uncategorized on January 22, 2015 by stripfix. This entry was posted in Uncategorized on January 23, 2015 by stripfix. Lynn's Comments: This story was told to me by our good friend Larry Boland. We were sitting in his living room. His wife, Marilyn, was bringing in the tea, when I looked up and admired their lovely ceiling. Marilyn smiled and said that thanks to Larry, it had just been redone. Larry described putting his foot through the plaster with such detail that I had to put the story in the strip. Things people WANTED me to include rarely made the grade. I preferred the embarrassing stuff! This entry was posted in Uncategorized on January 24, 2015 by stripfix. Lynn's Comments: One day, I got tired of seeing the pile of single socks and mittens that had accumulated next to the dryer, and I threw them all out. A while later, I was cleaning out the storage room, going through camping gear, old toys, and outdoor clothing, and I found a collection of single socks and mittens--mates to the ones I had thrown out. I wished I had looked through the camping gear first--but I might have tossed out all the single things only to discover their mates in the laundry. This entry was posted in Uncategorized on January 25, 2015 by stripfix. Lynn's Comments: I think I gave Larry and Marilyn the original strips for this story. It was something I liked to do when I embarrassed a friend in public! This entry was posted in Uncategorized on January 26, 2015 by stripfix. This entry was posted in Uncategorized on January 27, 2015 by stripfix. This entry was posted in Uncategorized on January 28, 2015 by stripfix. This entry was posted in Uncategorized on January 29, 2015 by stripfix. This entry was posted in Uncategorized on January 30, 2015 by stripfix. Lynn's Comments: This part of the story was entirely made up. This is what's fun about a comic strip storyline--the possibilities are endless. This is where the ability to fantasize comes in: a fantasy could take me completely away from reality--to places I didn't even know I could go! This entry was posted in Uncategorized on January 31, 2015 by stripfix.